The Dream Factory is an exciting new project from Honda, which brings together a number of the countries most creative and inventive individuals, in order to allow them to share their stories with the world. 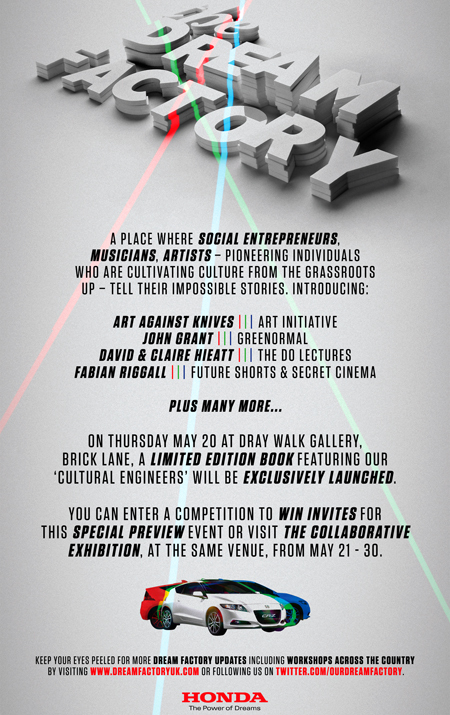 This Thursday, an exhibition about these ‘cultural engineers’ will take place at The Dray Walk Gallery on Brick Lane. The Dream Factory is described as “a place where social entrepreneurs, musicians and artists – pioneering individuals who are cultivating culture from the grassroots up – tell their impossible stories”. A brief look at some of the individuals involved shows exactly the calibre of creativity we’re talking about here, with the likes of Fabian Riggall (Future Shorts/Secret Cinema), Oliver Hemsley & Katie Dawe (Art Against Knives), Dicken Marshall (Rafiki Records) and artist Kevin Harman, all part of The Dream Factory. A full list of those involved can be found here. A book featuring the above cultural engineers will be launched at the event next Thursday. 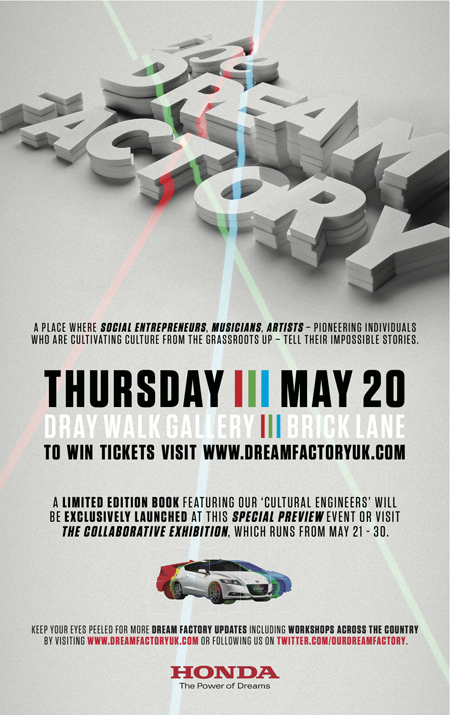 You can win tickets to the event at the Dream Factory website, where you can find more information on the project and upcoming events, as well as the Dream Factory Twitter.